I'm so excited and honored to be hosting a superstar today! 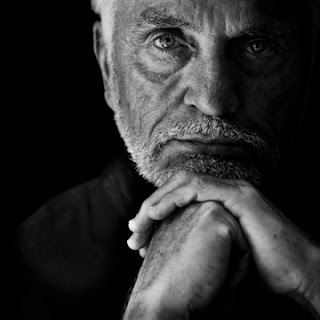 Terence Stamp is one of my favorite actors of all time. His career has spanned more than four decades, from his Academy-nominated and Golden Globe-winning title role in Billy Budd to his Cannes Film Festival Best Actor award winning role in The Collector to his portrayal of General Zod in the Superman movies, to Priscilla, Queen of the Desert and The Limey in the ‘90s to his more current work beside actors like Tom Cruise and Matt Damon. He’s an actor’s actor—every character nuanced and detailed —no two characterizations alike. And it turns out he’s an author as well. I’ve just started his third memoir, Rare Stamps, and it reads like a novel. A brisk, entertaining read. What a life he’s had! And it turns out he’s a neighbor—He lives in Ojai, CA about 150 miles south of Los Osos. And he’s offering a giveaway! One lucky commenter can win a free CD of Mr. Stamp reading Rare Stamps in that famous voice. Just put “CD” in your comment and you’ll be in the running for the prize. The winner will be chosen by the number generator at Random.org and announced next Sunday, August 12. Terence is being interviewed today by Alicia Street, friend of the blog and an award-winning author in her own right. She is also a regular contributor to the WG2E blog and creator of Reader2Author interviews. Alicia: How does the process of writing differ from the process of acting? Terence: When I am performing/acting at my best, the work is spontaneous; it exists in the moment. I am the character that I am portraying. Yet, when I am unable to get into the moment, for whatever reasons, I have fifty years of experience, or craft, to fall back and rely upon. So I can always get through ‘take’ or the film. In writing, when it is going well, in the flow so to speak, it is the same. It is spontaneous, in the moment. But when it is not going well, I do not have my craft to rely on, as I am trained in performing, not writing. So I must stop. Wait for inspiration. It is a much more stop-and-go process. Alicia: You have three memoirs. How did each affect you while mining the territory in those different phases of your life and career? For example, the first, Stamp Album, takes readers from your early days growing up on London’s East End, to rooming with fellow struggling actor Michael Caine, up to your initial success in the title role of Peter Ustinov’s film based on Herman Melville’s Billy Budd. Terence: Stamp Album was like a therapy. I was on the set of Wall Street when my mother passed away. I was very close to her and the fact of her passing and me being on a different continent was difficult to bear. I began to write, in my hotel, during breaks in the film, anytime I could get the chance. Recalling the time we had spent and all the things we had done together, and how she had influenced my life and my art. The words just flowed out of me. It was my catharsis, my therapy, and the first memoir came rather easily. Alicia: The second, Double Feature is about that special time when you were “the face” of the Sixties, an actor in demand and being seen with the beautiful people of Hollywood and London, that period when your career really took off. Terence: Yes, Double Feature was actually a continuation of Stamp Album. I wrote it because the first was well received and people wanted to know what happened next in my life and in my career. Also, by then, I enjoyed the process of writing…when the words flowed, that is. Alicia: What about the newest memoir, Rare Stamps? What inspired you to write that? Terence: It was the idea of my friend Richard LaPlante. He kept talking about a book for young actors and other artists, something I would write from my own experience, which has included stints at the very top as well as the bottom of my profession, in other words from an Academy nomination to unemployment. He thought it would be inspirational, as well as reassuring, and it would give me an opportunity to talk about the various physical and mental disciplines that have sustained and developed me throughout the years. I took him up on the idea and went to work scribbling. Alicia: Well, you certainly have had a long career, being born before the first WW II bomb hit London and you’re still working. I liked what you said at a press junket during the release of the film Valkyrie: “Hitler missed a big chance to prevent some of the dodgier movies I have made . . .” I know in addition to the big commercial films like Get Smart and The Adjustment Bureau, you like to do smaller, art films. Terence: Yes, I just finished Song For Marion, a small film in which I play an elderly pensioner who finds redemption through his voice and song. I was also genuinely moved by the screenplay. Terence: I have only written one novel, The Night, so my knowledge here is somewhat limited, but when I was writing it, my characters and scenes had to come right out of the ether. Everything was created from smoke, so to speak. Yes, my life experience and memories of people I have known helped in the shaping of characters and places, but it required me to conjure and project. In a screenplay, it’s all there. The screenwriter has already done the conjuring, the work. You may add a touch to his or her creation, but the basic form is already in front of you. Your job is to embody, not to pull the rabbit from the hat. Alicia: Hmm. Pulling a rabbit from a hat. That’s a great metaphor for the act of writing fiction. Has writing had any influence on your acting? Terence: There is probably a sub-conscious connection. You know, like being in the moment and going into the depths of your psyche to recall certain feeling and emotions, but generally, I don’t feel one as linked to the other. They, for me, are separate disciplines. Alicia: Getting back to the memoir, I noticed that aside from giving the reader a behind the scenes look, you talk about the process of art and career itself. Terence: Richard pushed me to include ways in which I dealt with my own insecurities, including unemployment. And to write about my experiences in India, studying with various masters, and a lot of very personal stuff that molded me, not only as an actor, but also as a man. Alicia: I know you do yoga and have been into healthy eating for many years. Now you’re also involved in a publishing venture, right? Escargot Books. What’s the story on that? Terence: Escargot Books was the brainchild of my friend Richard LaPlante, thriller writer and entrepreneur. He knew I had the rights to my earlier books. And he brought in another friend, author Peter Mayle, who had some older out-of-print works. It began as a small group of friends, all of a certain age and relatively successful in our various fields. But it is growing into an independent publishing company, with Richard as the editorial director, offering new books as well. Alicia: Like the new memoir coming from another friend, Rolling Stones founder Andrew Loog Oldham. Before we stop, I just have to ask you—what was your favorite role? Terence: From my early career, I would say the serial killer in The Collector. From the modern roles, it would be Wilson in The Limey, which took me back to my East End roots. How about you, scriveners? Were you surprised to find out Mr. Stamp is an author and publisher? Alicia says she’ll stop by and answer our questions. Don't forget to put "CD" in your comments to be eligible to win the CD of Rare Stamps. My question is: Is Escargot Books planning to reissue Mr. Stamp’s novel, The Night? Don't forget the Central Coast Writers Conference is coming up next month. I'll be teaching a course based on my book with Catherine Ryan Hyde: HOW TO BE A WRITER IN THE E-AGE. The paper version of the book should be making its debut at the Conference.